Are you ready for QE3? It’s the replay of 1H of 2008, only with more severity. 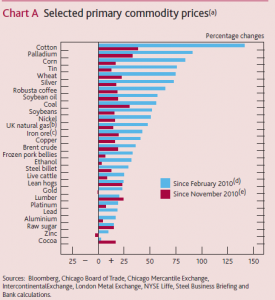 If were not for Lehman’s collapse, the prices of commodities would have shot to the roof more than two years ago. Now the still-the-same super easy monetary policy made commodity prices, especially food prices, come back again, evident everywhere in the world. China just reported its latest CPI number of close to 5%, but food prices jumped over 10% year over year. The food inflation forced China’s Bureau of Statistics to adjust down the weight of food in the CPI calculation. Isn’t this ridiculous! — The government wanted to you to believe as if inflation does not exist! At the same time, various signs show that the huge excess reserves are being gradually unleashed from banks’ balance sheets — one indicator is that the yield on junk bonds has almost reached historical lows; another sign is that banks now started to relax their lending standards to both consumers and small businesses. What we are seeing is exactly the divergence of traditional inflation measure (CPI) and asset inflation. Let’s call it “biflation”. What do the years 1971, 2003 and 2010 have in common? In each year, low U.S. interest rates and the expectation of dollar depreciation led to massive “hot” money outflows from the U.S. and world-wide inflation. And in all three cases, foreign central banks intervened heavily to buy dollars to prevent their currencies from appreciating. When central banks issue base money to buy dollars, domestic interest rates are forced down and domestic inflationary pressure is generated. 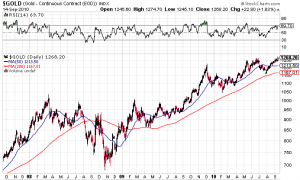 Primary commodity prices go up quickly because speculators can easily bid for long positions in organized commodity futures markets when interest rates are low. The world saw a surge in the dollar prices of primary commodity prices in 1971-73 following the Nixon shock of 1971 when the U.S. abandoned the gold standard. There was also a commodity price surge during the Greenspan-Bernanke shock of 2003-04, when the federal-funds rate was reduced to an unprecedented low of 1% followed by a falling dollar. Now we have what one might call the Bernanke shock. The Fed has set U.S. short-term interest rates at essentially zero since September 2008, followed in 2010 by quantitative easing to drive down long-term rates. Predictably, primary commodity prices in 2009-10 surged. In 2010 alone, all items in the Economist’s dollar commodity price index rose 33.5%, while the industrial raw materials component soared a remarkable 37.4.%. The longer-term inflationary and economic consequences over the next decade of this most recent U.S. loose money shock remain to be seen. But we can glean useful hints by looking at the aftermaths of the two earlier shocks. In the 1970s, “stagflation” (inflation combined with cyclical bouts of unemployment and wide swings in exchange rates) seemed intractable. Productivity growth in mature industrial countries fell sharply. The Greenspan-Bernanke interest rate shock of 2003-04, followed by a weakening dollar into the first half of 2008, created the bubble economy. 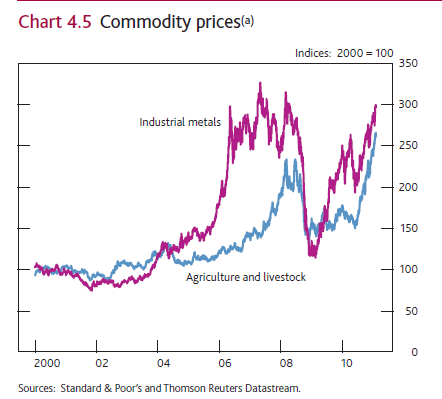 Primary commodity prices began rising significantly in 2003-04, then flattened out before spiking in 2007 into the first half of 2008. But the biggest bubble was in real estate, both commercial and residential. With low mortgage rates and no restraining regulation on mortgage quality, average U.S. home prices rose more than 50% from the beginning of 2003 to the middle of 2006. This led to an unsustainable building boom—with echoes around the world in countries such as the U.K, Spain and Ireland. 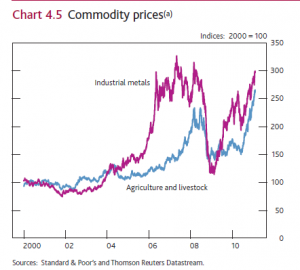 The bubbles in primary commodity prices collapsed mainly in the second half of 2008. But the residue of bad debts, particularly ongoing mortgage defaults, led to the banking crisis and global downturn of 2008-09. So what lessons can we draw from these episodes of U.S. easy money and a weak dollar for the stability of the American economy itself? First, sharp general price increases in auction-market goods such as primary commodities or foreign exchange (i.e., a weakening dollar) is an early warning sign that the Fed is being too easy—a warning that the Fed is again ignoring as we enter 2011. Second, beyond the rise in primary commodity prices, general price inflation in the U.S. only comes with long and variable lags. After the U.S. monetary shock, hot money flows into countries on the dollar standard’s periphery cause a loss of monetary control and general inflation to show up there more quickly than in the U.S. In 2010, consumer price indexes shot up more than 5% in major emerging markets such as China, Brazil and Indonesia, while the consumer price index in the U.S. itself rose only 1.2%. Similarly, after the Nixon shock of 1971, there was much more explosive inflation in Japan in 1972-73 than in the U.S. But by December 1979, inflation in America’s producer and consumer price indexes was more than 13%. Jim Rogers – Bernanke simply does not know what he’s doing; Gold reaching $2000 in 5-10 years is given. 2) when everybody tells you, “This time is different”. We are nowhere near that point. Not yet.